How long you haven´t played proper escape game? Well, yes, there was a new Tesshi-e recently, but except for this one? It was the Christmas Tesshi-e, right? Not many big escapes these days, really. I´m not complaining, I´m just a little sad as a big escape games fan. Luckily, some designers still do them and KamotoKamotoKamo is one of them. In Nunu Kid Escape you find yourself locked at a place which seems as built especially for escapes. Definitely not a usual apartment, not many apartments have a deep pit in the middle of a room. Without any railing! Soft ringing music sounds around, but if you don´t like it there is a switch on/off button in lower righ corner. The cursor changes at active spots and for navigation use the side bars. The rooms seem quite empty with not much to explore but there is more than you see at a first sight. Just be careful and look around everywhere. Soon you find out there is something really strange about this place, like a hole in the wall without obvious purpose, a niche out of your reach by the pit, and more......remember, all the peculiarities have a purpose, and you have to figure it out and use it, somehow. If you want to escape. Everything is kind and not disturbing in this game, music, mild colours and soft light. Toys everywhere and even keys are decorated with cute animals ornaments. Almost a kids´room (if there wasn´t the pit, of course). Puzzles and their solutions are not childish though, and require some creative thinking and time. There is a safe button. The game has two endings. The difference is one puzzle and one cake you get after solving it. There's a blue flower-shaped table with a note on it. On the right of it, there's a chair with wooden cats topping its backrest. Turn right. There's a bear box which takes a three-digit code. This one's a bit more interesting than your usual codes: the digits are blue, squarish, and arranged from top to bottom. Turn right. There's a large window on this wall, except it's fake: it doesn't open to the outside, and it's blocked by eighteen wooden columns. Many of these posts are secured on the bottom, but click around and you'll find that the 4th, 11th, and 13th from the left are removable, and removing them reveals darker sections of wall behind. Now you have three wooden poles. Turn right. There's a doorway, but before you go through, take note of the small perfectly circular hole in the wall to the right of the doorway, and the green hexagons above that look like the digit 1 from a seven-segment LCD (display), but rotated to the left. Straight ahead, there's a duck box with three square holes, separated by a dot and colon (?.?:?). Turn left. There's a hole near the top of this wall, but it's too high to reach. There's a larger hole in the ground, which you can click on to look down. There are some weird squarish figures down there, and another hole in the wall below. Turn left. On the inside of the door is a figure that seems familiar, with the rectangle in the middle having a familiar pattern and alternating light and dark lines. Clearly this is supposed to match the "window" from the previous room. Clicking on a light line turns it into a pair of lines. Doing it again turns it into three, and so on up to seven before it resets. The wall to the left of the door is more interesting. There's that same round hole from before, but also a vertical slit above it with a white piece inside with a tiny pentagonal hole in it. And above that, there's a section of wall with two holes and two hinges. You can vaguely see the rectangular outline of something. Turn left. There's a rack here shaped like a castle, and a prince figurine that you can pick up. Removing 3 posts from the window divided the remaining posts into 4 groups, separated by dark gaps. Those groups have 3, 6, 1 and 5 respectively, so click the buttons on the inside of the door 2, 5, 0 and 4 times. The code panel opens up. Take the square wooden piece with a diamond carving. Remember the hole in the floor and squarish figures? It's actually multiple shapes, and the top one looks like a 7. The next one is a 3 (rotated), and the bottom one is a 4. In the bear box, put 7 on top, 3 in the middle and 4 on the bottom. The box opens. Take the wooden piece with a circle carving. Follow the clue on the low table to place the square wooden pieces in the duck box. Just watch out for a twist. The clue is reversed (or upside-down) compared to the markings on the box. So place the pieces in the order Circle.Hexagon:Diamond to open it. Remove a cylinder with a dog face. Turn it over and notice the pentagonal protrusion on the back. Use it on the vertical slit on the wall, turning it into a lever! Nothing changed in this room, so go back to the first one. The table is different: it's now a paw-shaped table with a light-colored duck key on it. There's also another chair to the left of the table. It's a mirror image of the first chair, as you can tell by the heights of the cats. The low table is different. Actually, it's missing. What is this sorcery? Place the chairs on the sides of the hole in the floor, with backs facing each other. Then use the poles on the chairs. Now you can climb up to the top hole to get a thick rope with hook. Hook the rope onto the poles so it hangs into the hole below. Click on it to climb down and take a dark-colored duck key. Climb back up and pick up the rope. Pulling the lever changes the room next door. What if we're in that room when it changes? Hook the rope onto the lever and pass the free end through the hole in the wall. Make sure the lever is up, then go to the other room and pull on the end of the rope. The wall move upward. Or rather, the floor moves downwards. The rope and hole in the wall is replaced with an up elevator button. There's a code panel on the same wall as this button. It takes a three-digit code with red (seven-segment) LCD digits. Turn right. The table is the same, so turn right again. Instead of the bear box, there's now a cow statue, which has a horseshoe-shaped metal piece hanging on his right eyebrow. Turn right. There's a rotated green LCD 3 on top of a box displaying a picture. Take the note on top of the box, and then examine the picture. With this notation, the starting room was B/1, and the "changed" first room was B/2 — same walls, different floor. You now have two (folded) notes in your inventory. Unfold them and piece the clues together. The red markings on the notes read out 908 when superimposed. 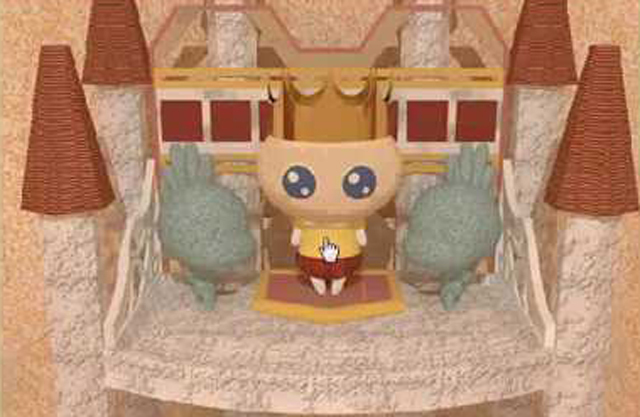 Enter this into the code panel, and take the prince figure from inside. Press the elevator button to go up, and go back into the room with the lever. Use the metal piece on the pair of holes in the wall. Click on it to open the hidden compartment. Take the prince figure from inside. To reach the top floor, we need to pull the lever up from the next room while it's down (i.e. from room B/1). There's just one problem: pushing the rope through the hole doesn't push the lever up. Only pulling on the rope end works. How do you make the rope pull the lever up? Hook the rope on the lever as before, but now pass the rope through the metal handle, using it as a pulley. Make sure the lever is down, then go next door and pull on the free end. The walls move down! Actually, the floors move up! The hole and rope are replaced by a down elevator button. The doorway is replaced by a locked door, with five rectangular holes in it around a sideways green LCD 5. There's a crown marked over the top of all of that. Turn right. The table is unchanged. Turn right again. The bear box is still there. Huh? This one is locked, and has a keyhole. Turn right. The low table is back, so open its cupboard door with the light duck key to get another prince figure. The "window" has been replaced with a three-digit code-panel, with green LCD digits. The decoration on top of this panel matches the decoration on the left edge of the map in the basement. The three digits were in different rooms (C, B and A). Enter 315 into the code panel, which opens. Take the prince figure (what an awkward pose!). which means you can escape this fancy elevator shaft. But there's two endings, so here's where you save the game. Place the five princes in the door marked with a crown. After it opens up, click the doorway to escape. Enjoy an afternoon of tea with friends on the rooftop. But wait, perhaps you're a completionist and really want to solve that puzzle and use that clue. Use the dark duck key to unlock the second bear box. The three buttons are now available, and display an upward-pointing triangle, square, and downward-pointing triangle, all in red. Have you seen any of those symbols before? The banner behind the first prince had seven squares on it. So press the middle button seven times. Take the cake box from inside. Use your five princes on the crown door to unlock it and escape. Enjoy both tea and cake with your friends on the rooftop! I loved this escape game - the different rooms were so well done. Besides having great puzzles, this game is gorgeous. I could take the rope back. Could be an adblocker, you have to disable it on their website. Thank you but there's no way. it didnt work for me either, using Google Chrome, with or without adblock. however, it did work with Internet Explorer ... go figure.